Inspirational reading feeds our soul, fuels our imagination, infuses our mind with thoughts that allow us to create lives in alignment with our dreams and desires. 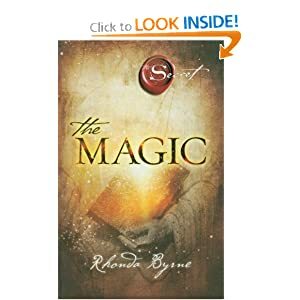 The book, gifted for a few days over the weekend, is The Magic by Rhonda Byrne. The magic in our lives is gratitude. The energy of love and joy. Now begin and end each day with thank yous, gratefulness, love, appreciation in your heart. Notice everything and everyone and every detail you are grateful for. Write them out, talk about them, express them. Continue tapping the power of gratitude, goals and dreams, and manifesting your magnificence; read the Magic for inspiration; add Wellness Goals and Dreams worksheets and resources; partner with someone to support and celebrate your spirit and growing. Share your gratitudes out loud, get clear on what you want, talk about your goals and dreams. I love coffee conversations, even when they’re over the phone. You can tap in to that love stream too. Love and blessing, gratitude and happiness. I already feel them for you. Let our magic continue.